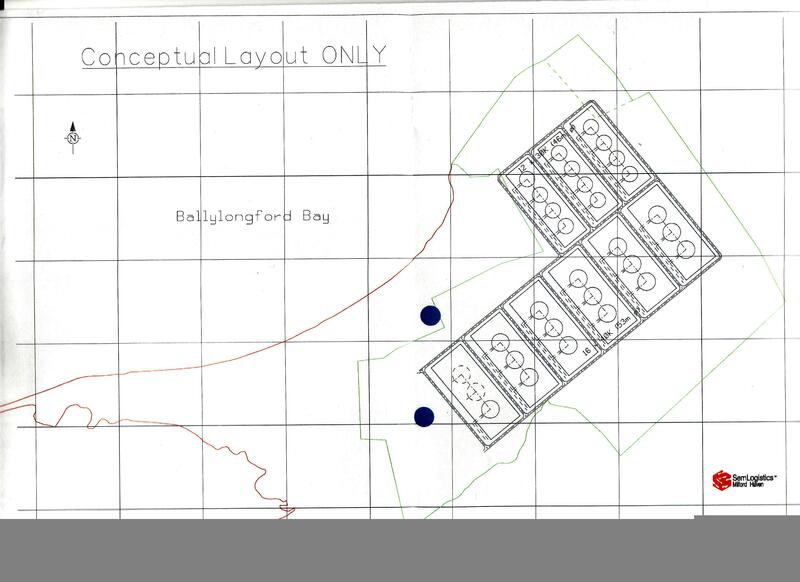 Planning application documents and maps from An Bord Plean�la for SemEuro 1 million cubic metres of petroleum storage tanks adjacent to proposed Shannon LNG terminal at Tarbert, County Kerry, Ireland. SemEuro, the company planning the country’s largest petroleum storage facility adjacent to the Shannon LNG terminal in Tarbert, has dramatically withdrawn its application at An Bord Plean�la following a sustained campaign against the project by the ‘Safety Before LNG’ group. 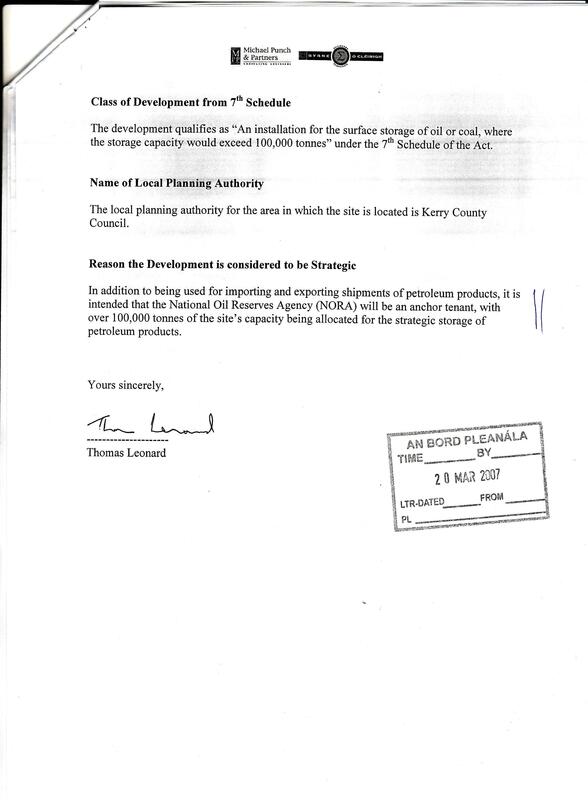 The proposed development was for approximately 30 atmospheric storage tanks for the storage and distribution of Class I, II and III petroleum products (gasoline, kerosene, gas oil and diesel). The site would have had a total capacity of one million cubic metres (or 220 million gallons) with a throughput of 3 to 5 million tonnes annually. 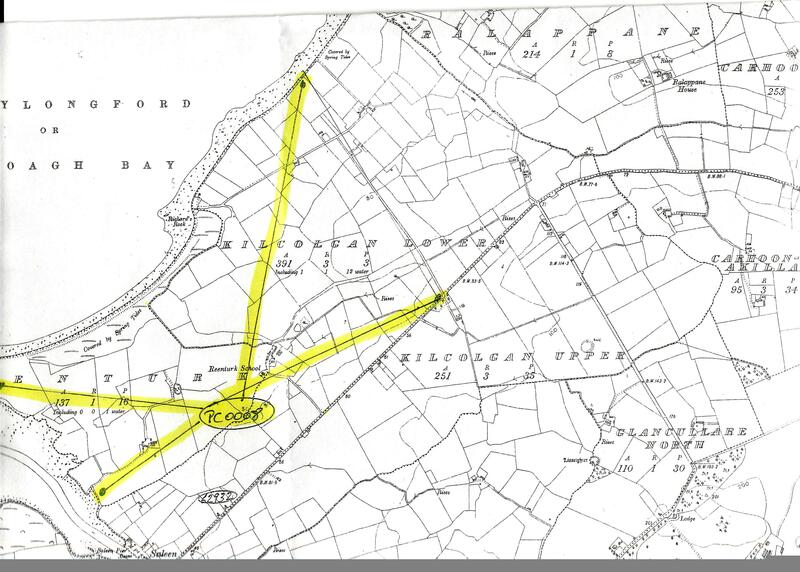 It was to be constructed on Shannon Development land on the Ballylongford side (West) of the proposed Shannon LNG terminal between Kilcolgan Strand Road and the breathtakingly scenic Saleen Pier. The development envisaged would have been a sea-in, sea-out storage facility terminal with the future inland distribution of oil by barge or road being a possible consideration at a later stage. In addition to being used for importing and exporting shipments of petroleum products, it was intended that the National Oil Reserves Agency (NORA) would be an anchor tenant for over 100,000 tonnes of the site’s capacity which was being allocated for the strategic storage of petroleum products. This would allow it qualify as fast-track strategic infrastructure under the 7th schedule of the Strategic Infrastructure Act 2006 - namely “an installation for the surface storage of oil or coal, where the storage capacity would exceed 100,000 tonnes”. Shannon Foynes Port Company, according to the applicant, seemed “to be comfortable with the proposed location of the jetty” adjacent to the LNG terminal. Consultation had also taken place with Kerry County Council and the Health and Safety Authority, SemEuro stated. 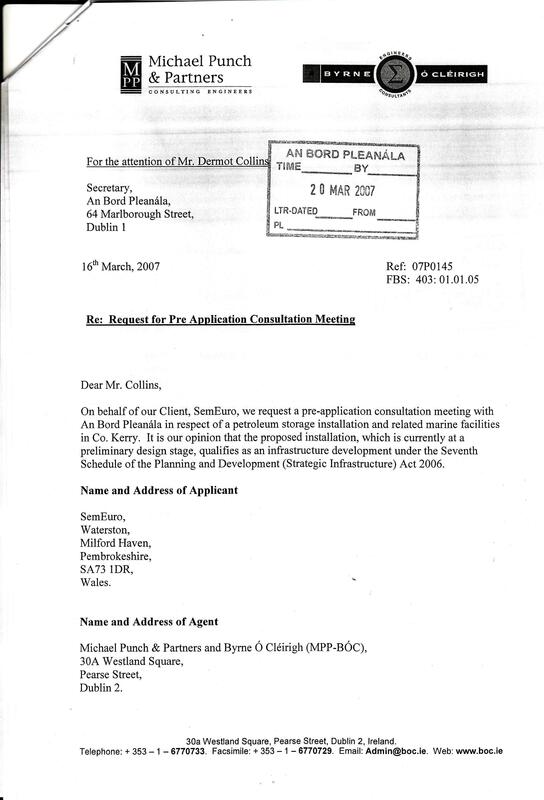 SemEuro confirmed to An Bord Plean�la on November 17th 2008, that it “had not been able to reach an agreement with Shannon Development and so is not pursuing this option at present”. 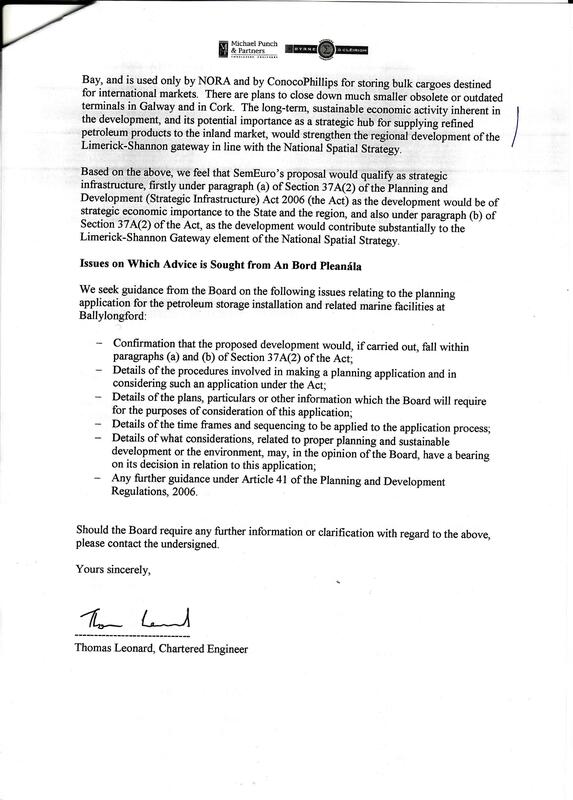 ‘Safety Before LNG’ group spokesman, Johnny McElligott, lambasted Shannon Development for its attempts to attract two enormous dirty and dangerous gas and oil terminals to the 600-acre Tarbert Landbank without any strategic environmental assessments being undertaken in such an environmentally-sensitive area. 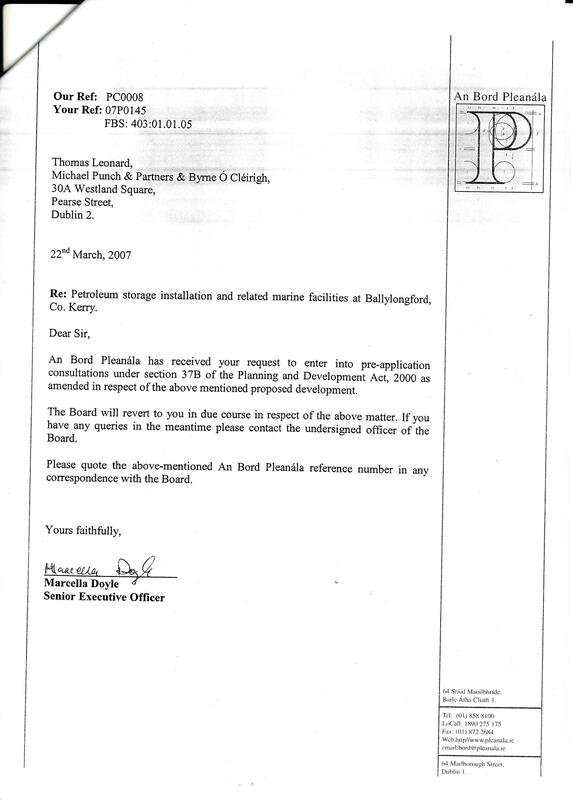 Shannon Development and Kerry County Council are only concerned about money and pay only lip service to environmental, safety and sustainable development concerns. They have no concern for exclusion zones which will sterilise development and movement on the land and on the estuary. 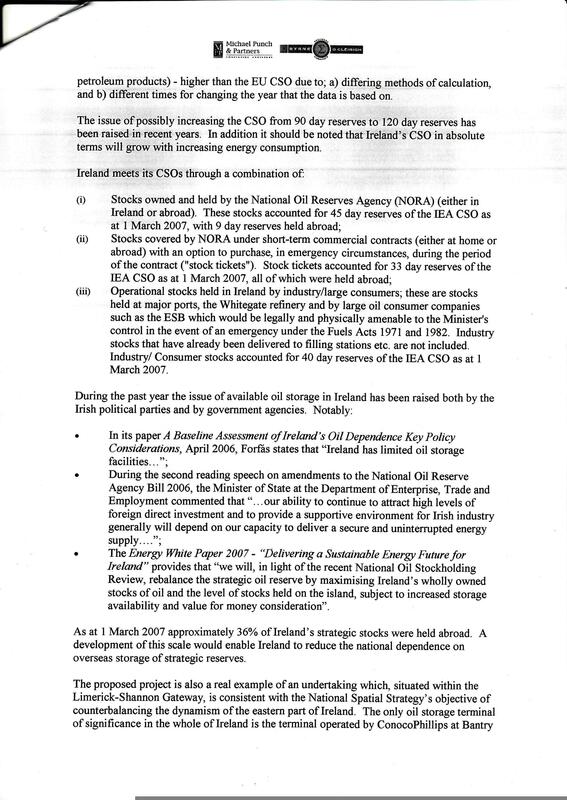 It is crazy to even contemplate an energy storage hub on the southern shores of the Shannon Estuary at the scale envisaged without any forward or strategic planning. It is yet another example of mismanagement of the country’s richest assets. The entire facility would be in full view of Lislaughtin Abbey and Carrigafoyle Castle. Oil and gas are a lethal mix and both the developers and Shannon Development have shown a complete disregard for the health and safety of the local residents in particular and for the North Kerry region and Shannon Estuary in general. 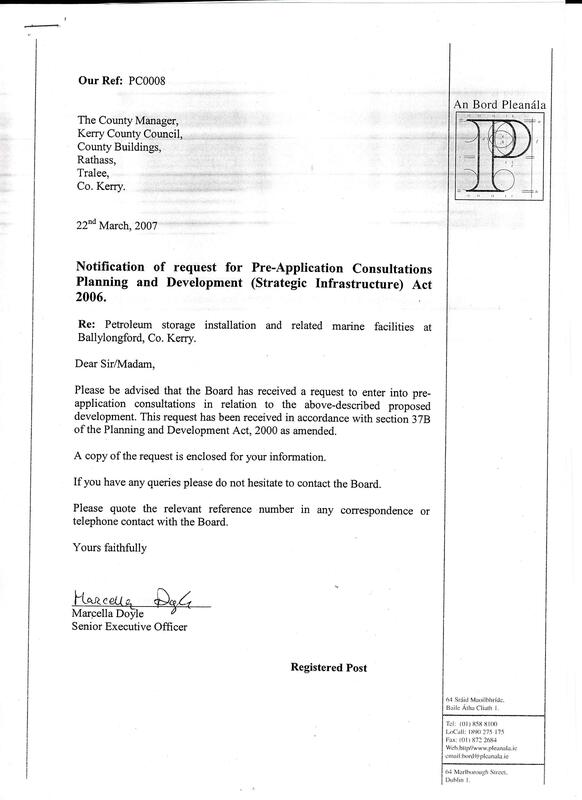 The group also criticised comments made by North Kerry T.D. 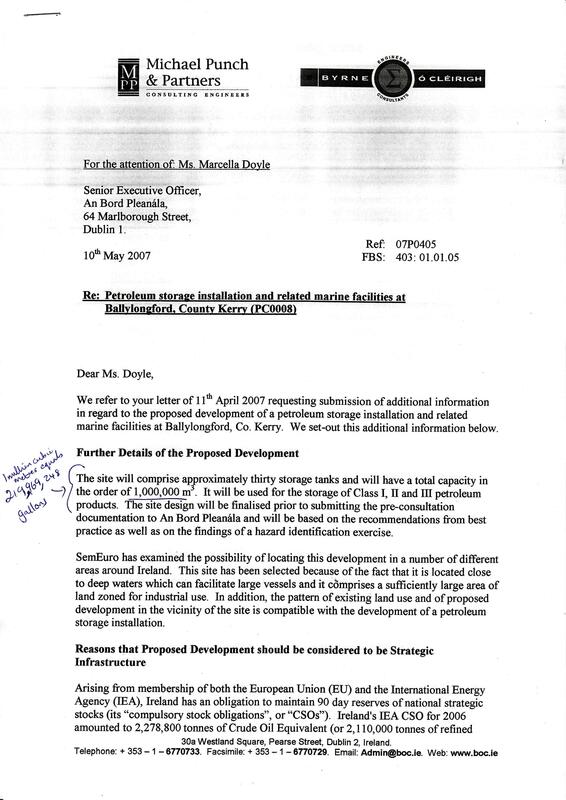 Jimmy Deenihan for promoting the LNG Terminal project at Tarbert as an environmentally-friendly “green energy” project. 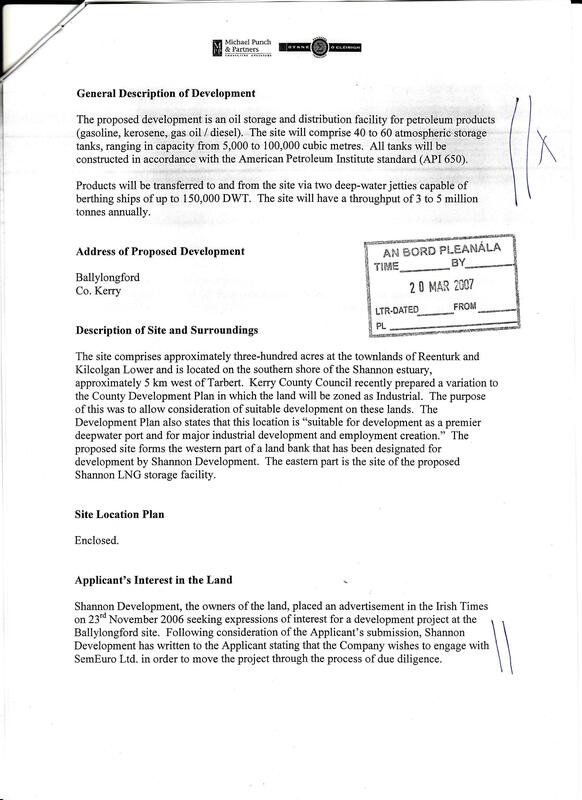 The TD, according to the Kerryman newspaper of February 25th 2009 has called “for a green energy park to be created in the area“, saying “that Kerry could now become leaders in clean fuel”. Can someone please explain to Deputy Deenihan that LIQUEFIED NATURAL GAS is a fossil fuel? The group also believes that the presence of 90 acres of trees on the site will first have to be dealt with before the SemEuro project can go ahead. 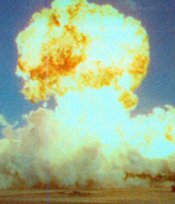 However, the LNG terminal oral hearing was told by Shannon LNG that trees would offer protection in the case of a heat blast wave in the case of an LNG accident. We now believe that these trees form a safety mechanism as proposed by Shannon LNG that will have to be addressed by Shannon Development and SemEuro before the Petroleum storage project can proceed. The ‘Safety Before LNG’ group also encouraged other local community groups that defeating the mighty SemEuro proved that individuals can still make their voice heard if they engage in the planning process at the earliest possible stages. Sometimes, though, the worst of ideas can slip under the radar until it is too late.